"Several car dealerships were located in Wakefield, selling models which ranged from Chevrolets to Oldsmobiles, DeSotos, Plymouths, Buicks and Studebakers. 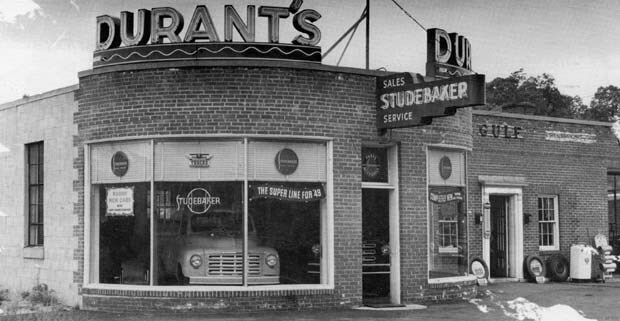 Durant Motors, located at 795 Main Street in Greenwood, was owned and operated by John Durant, who later developed the Tuttle Street area in the early 1960s. Durant's first auto repair business, Greenwood Motors, was located at 885 Main Street near Melrose. In 1939, he moved his business to 6 Greenwood Street, and in 1940, he was appointed as a Plymouth and DeSoto dealer. He opened a showroom at 89 Albion Street. After serving his country during World War II, he purchased the 795 Main Street property in 1946. Soon after, he aquired the Studebaker franchise. According to records of the time, Studebaker 'originated a new idea in car styling. The new closed car with an open car outlook on the passing scene is something out of the ordinary.' The 1949 trucks were also 'brand new in design and performance.' In addition to selling cars, Durant's Motors also had a modern service station with factory-trained experts. In December, 1952, Durant Motor Sales was sold and became Alan Motors of 793 Main Street." -- Text from calendar by Jayne M. D'Onofrio. “Durant's Motors and Gulf Station, 795 Main Street, Greenwood, 1949,” NOBLE Digital Heritage, accessed April 20, 2019, https://digitalheritage.noblenet.org/noble/items/show/6926.